Step 1 In a food processor, pulse the nuts and sugar until the nuts are finely ground. Add the butter and pulse about 15 times, until no loose particles of the nut-sugar mixture remain. Add the flour and salt and pulse again, about 10 times, or until the butter is no larger than small peas. Alternatively, finely grate the nuts and place them in a medium bowl. Add the sugar, flour and salt, stirring to combine. Cut in the cold butter using a pastry cutter or two knives until the mixture resembles coarse meal. Step 2 In a small bowl, stir together the yolk and cream. Add it to the mixture and pulse or mix just until incorporated, about 8 times. Knead the dough lightly, just until it holds together. Flatten it into a 6-inch disc, wrap the dough well in plastic wrap, and refrigerate for 30 minutes or freeze it for 10 minutes, until firm enough to pat into the pan or roll. Step 3Remove the chilled dough from the refrigerator and lightly flour it on both sides. Place the dough between two sheets of plastic wrap and gently roll it out into a one-eighth-inch circle slightly more than 12 inches in diameter. At this point, if the dough feels too soft to place in the pan, place the dough, still between the plastic wrap, onto a cookie sheet and into the refrigerator for a few minutes to firm up. Step 4Remove the top sheet of plastic wrap from the dough and use the bottom sheet to lift and invert the dough over a 10-inch-by-1-inch tart pan with a removable bottom. Evenly drape the dough into the tart pan, pressing it gently into the sides. If the plastic wrap sticks, refrigerate or freeze the dough until it is firm enough to be removed easily. Step 5Trim any off the top of the sides, leaving about one-eighth-inch dough over the sides to accommodate any shrinkage during baking. Use the excess dough to patch cracks. You will probably have a little dough left over. Step 6Place the tart pan in the refrigerator for at least one hour to chill the dough before baking. Heat the oven to 425 degrees. Step 7Remove the chilled dough from the refrigerator and prick the bottom of the dough all over with a fork. Place the tart shell in the oven and bake for 5 minutes. After 5 minutes, reduce the heat to 375 degrees and continue to bake for 10 to 15 minutes until the bottom of the crust is golden and set and the sides are a deeper golden brown. Remove the crust from the oven and cool on a rack. The baked crust will keep at room temperature in an airtight container for up to 2 days. In Recipes-list.com we have selected the most viewed recipes from category - Desserts . Enjoy the best recipes specially selected for you! 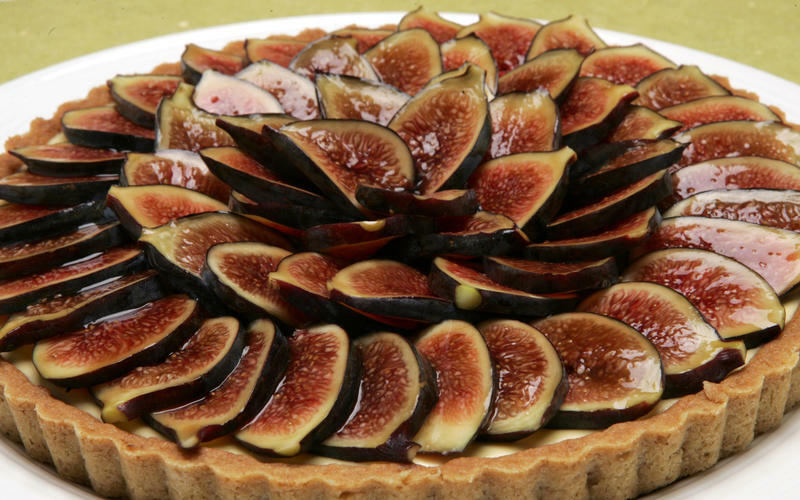 Fig tart with mascarpone cream is the right choice that will satisfy all your claims.